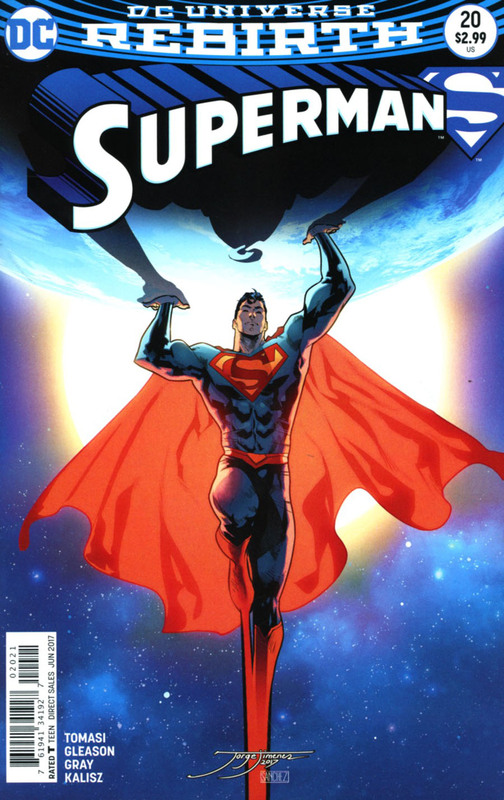 With existence aligned, Superman is back and in a brighter red and blue costume. The world is inspired by him and the 'Smith' identity has gone in favor of 'Kent'. As Cobb drives past the farm he warns Lois of a storm, so the Kents take shelter in their basement to ride it out. Lois approaches the subject of the alignment but Clark shrugs it off, enjoying the new status quo too much, he tells her that they'll figure out anything that comes along. Spotting a shadow of a man stalking the farm Jon is worried that Other Clark might have returned, dons his jacket and sneaks to the barn. There the figure is revealed to be Batman, accompanied by Robin. Lois and Clark are more than aware of their presence and confront the three of them inviting them in for a civilized talk. Batman tells Clark that from their test Superboy should be at his optimum level by now, even more powerful than his father, but for some reason Jon isn't progressing. Batman sees the darkness and the possible threat where Superman sees things with optimism and focuses on the positives. When Batman surmises something environmental might be limiting Jon and discovers that Cobb is their primary source of food in Hamilton, he immediately suspects Kathy's grandfather. Story - 5: Nothing from Reborn is dealt with here, instead the Kents enjoy their new life tweaked with minor changes - that isn't a bad thing as everywhere in DC for months we've been told across several titles and by characters in the know but unwilling to elaborate that Superman and the Kents are not who they think they are... it was nice to just have the Kents and Superman enjoy life a little. The continuity is a little out of sync with Justice League a month behind, with Timeless and Super Sons seemingly also behind as noted by the apple pie scene with Damian. The confrontation with Batman only serves to reinforce their light versus dark lifestyles and outlooks, though Clark is suddenly far more optimistic (which is a welcome change as angst doesn't suit him). We finally have the mystery of the Cobb farm coming to the fore and what that might mean for the future is an interesting mystery, especially given Batman's fate. I would have liked a little more elaboration on what happened to continuity, whether Ma and Pa are alive, etc... but I'm willing to enjoy the ride. I'm also more than glad that the whole 'society is suspicious of Superman' outlook has been replaced by 'he is a symbol of hope' because it means we are really getting a Superman that is 'the best of us' back. I have optimism and trust in Jurgens, Gleason and Tomasi. They've more than earned it since Rebirth began. Art - 4: With the upturn of hope in the book, I'm hoping the cartoon styling will begin to be downplayed somewhat in favor of a tone more in keeping with the writing. Jon's cartoony portrayal was fun but, like Batman, I'm keen for the kid to start acting and looking more like a responsible kid and less like a goofy anime kid that doesn't really fit with the rest of the book's look. Jon aside, there is a gentle warmth in Gleason's art. It feels familiar and cosy, so after the recent events it was nice to have that comfortable feeling. Cover Art - 4: Physical proportions aside, this cover reiterates the optimism. Unfortunately the palette is muted because of the horizon but the theme is not lost and promises a brighter future. I really liked this rendition, he finally seems happy and hopeful. Variant Cover Art - 5: THIS IS SUPERMAN! Jimenez & Sanchez take everything about the direct cover and kick it up a notch. 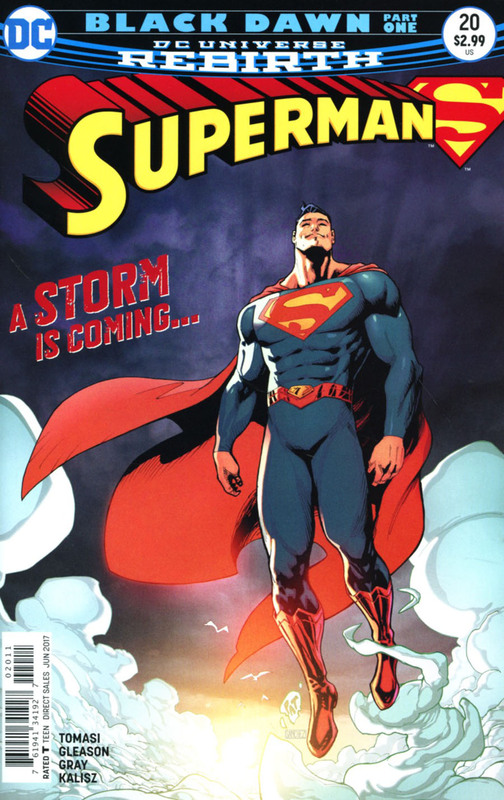 I kind of wish this was the image released to reveal Superman's new beginning because it is AWESOME!